Today is Shrove Tuesday – a.k.a. Pancake Day in much of the world. Shrove Tuesday is another name for Fat Tuesday, or the start of Mardi Gras. The pancakes enter into the equation because in England (which is where the name Shrove Tuesday comes from), things like butter, milk and eggs were not to be consumed during Lent. Making big batches of pancakes was a great way to use up these ingredients and enjoy some indulgence before the 40-day Lent period. Whether you’re religious or not (with respect to Lent, in this instance), just about everyone can ge behind the idea of a day to celebrate pancakes. 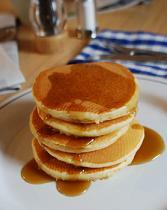 IHOP is even giving out a free short stack of pancakes to all customers between 7am and 10am! There is a way to get some pancakes infused into your day even if you’re not much of a cook. You can create a pancake latte at Starbucks. It’s not on the menu and it looks very strange, but tastes pretty much exactly like pancakes. The drink in question? A green tea latte – no water – with toffee nut syrup. Get any kind of milk you like in the drink, although soy is a pretty good choice for the extra bit of vanilla flavor. It may not look like pancakes, but it does taste like them. And if you’re not cooking or going for the real thing, it’s definitely not a bad substitute.